LOS ANGELES - Kenta Maeda was tagged with his eighth loss on Tuesday and first since being reassigned to relief duty as the Los Angeles Dodgers fell 2-1 to the San Francisco Giants. 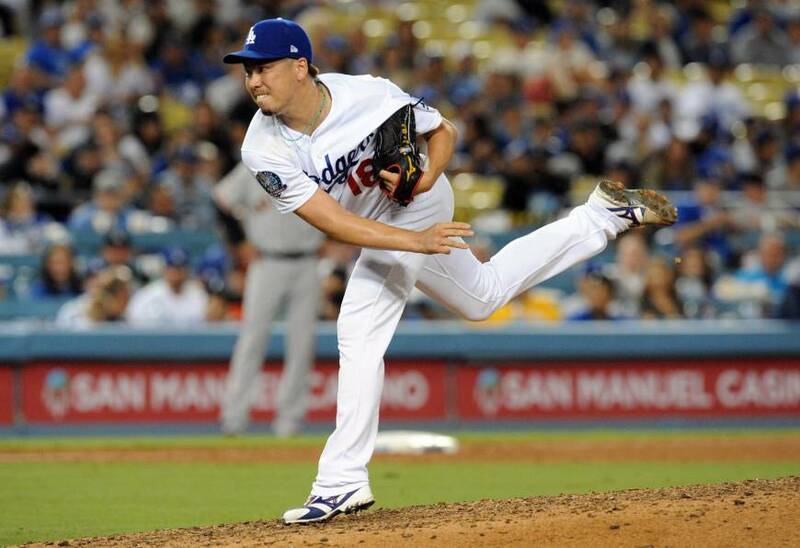 Maeda (7-8), coming on in relief for the first time since July 15, took the mound with the score tied in the ninth at Dodger Stadium and yielded singles to his first two batters. He retired the next two but allowed a single from Alen Hanson that drove in the Giants’ go-ahead run before throwing home to catcher Yasmani Grandal for the inning-ending tag at the plate. In the bottom of the inning, Cody Bellinger singled and stole second before pinch hitter Max Muncy took Maeda’s turn at bat. Muncy struck out against Giants’ closer Will Smith to end the game. Reliever Sam Dyson (3-2) got the win despite allowing the tying run in the eighth. 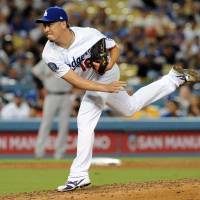 The 30-year-old Maeda was moved to the Dodgers’ bullpen Sunday to make room for lefty Ryu Hyun-jin, who was set to make his first start Wednesday after a two-month stint on the disabled list with a left groin strain. The game turned into a feisty affair in the seventh, as Yasiel Puig had another rumble with the Giants and took a swing at San Francisco catcher Nick Hundley during a benches-clearing scrap. The fracas started when Puig swatted his bat in frustration after fouling off a pitch from Tony Watson, and Hundley said something to the mercurial slugger while still in his crouch. Puig turned around and walked toward Hundley, the catcher stood up, and they argued face to face for a moment before Puig shoved Hundley twice. “When I missed the pitch, I knew that was the best pitch Watson was going to throw me so I was a little upset,” Puig said via a translator. “(Hundley) told me to stop complaining and get back into the box. When I got in his face he also told me to get out of his face so that’s when I got upset. “It doesn’t happen with other teams,” Puig said. In Arlington, Texas, Paul Goldschmidt hit his 27th homer to put Arizona ahead to stay, and All-Star lefty Patrick Corbin worked seven innings for his 10th victory. Diamondbacks reliever Yoshihisa Hirano faced one batter and started a double play that closed out the eighth inning. “In Japan, you practice that (double play) until you are sick of it, but there is something to be said about having a good feel for it,” Hirano said. Corbin (10-4) struck out seven without a walk while allowing three runs and throwing 66 of 96 pitches for strikes. He has made 10 consecutive starts without allowing a homer, the longest span for the Diamondbacks in 15 years and matching Boston’s Chris Sale for the longest active streak in the majors. In Atlanta, Ronald Acuna Jr. became the youngest player in major league history to homer in five straight games, hitting a leadoff shot on the first pitch and later adding a three-run drive to help the surging Braves beat Miami. The 20-year-old Acuna homered on the Marlins’ first pitch for the second straight night and became the first player to hit a leadoff homer in three consecutive games since Baltimore’s Brady Anderson went deep in four straight in 1996. On Monday, he became the fourth player in major league history to hit leadoff homers in both games of a doubleheader. In San Diego, Justin Upton had three hits, including a home run for the second straight night, and drove in three runs to lead Los Angeles past the Padres. Shohei Ohtani drew a walk as a ninth-inning pinch hitter and stole his sixth base of the season, but was left stranded. Eric Young Jr. tripled and had two RBIs, and rookie Taylor Ward had two hits, including an RBI double in his first major league at-bat. In Houston, Nolan Arenado and Trevor Story each went deep, German Marquez pitched well in a matchup with Justin Verlander, and Colorado beat slumping Houston. The Astros have matched a season high with five straight losses and extended their home skid to nine games. In St. Louis, John Gant homered for his first major league hit and pitched one-run ball into the sixth inning, helping the Cardinals to their season-high seventh consecutive victory. Kolten Wong had three hits and three RBIs as St. Louis (65-55) pulled within four games of the NL Central-leading Cubs and moved within one game of the Phillies for the second NL wild card. The Cardinals also improved to 18-9 since Mike Shildt became interim manager on July 13, the most wins for a manager through his first 27 games in franchise history. In Chicago, Ryan Braun hit two of Milwaukee’s four homers, Jhoulys Chacin struck out 10 in seven innings and the Brewers cut into the Cubs NL Central lead. In Philadelphia, pinch hitter Brock Holt hit a tiebreaking solo homer, Rick Porcello threw seven impressive innings and major league-leading Boston won again. Sandy Leon also went deep for the Red Sox, who improved to 86-35. Boston increased its total to 168 homers, matching its number from last year when the team hit an AL-low 168. In Cincinnati, Jose Ramirez hit his 36th home run and Cleveland ace Corey Kluber extended his dominance over the Reds. The Indians have won the first two games of the series by a combined 18-4 despite a rough week with outfielder Leonys Martin hospitalized with a serious bacterial infection and right-hander Trevor Bauer on the DL with a fractured right leg. In Minneapolis, Jorge Polanco got two hits, scored twice and drove in two runs and Miguel Sano hit a two-run homer to lift the Twins to a win over Pittsburgh. Jake Odorizzi (5-7) won for the first time in six starts, striking out nine in 5⅔ innings. Trevor Hildenberger, the Twins’ fourth reliever, pitched a scoreless ninth for his second save since the trade of closer Fernando Rodney. In Oakland, Jed Lowrie hit his 100th career homer long after his line drive knocked Mariners ace James Paxton out of the game, and the Athletics moved within one game of the slumping Houston Astros for the AL West lead. Felix Hernandez (8-11) replaced Paxton in the first relief appearance of his career after 398 starts. The former Cy Young Award winner, who has struggled all year and was demoted to the bullpen last week, allowed two runs in 5⅔ innings. Robinson Cano returned to Seattle’s lineup after serving an 80-game suspension for using a diuretic that can mask performance-enhancing drugs. The eight-time All-Star batted second and played first base, going 1-for-4. In Detroit, Ryan LaMarre hit his first major league home run, a drive that bounced off the top of the bullpen shelter in left field and into the hands of his uncle, as Chicago beat Detroit. LaMarre was born 10 miles (16 km) north of Comerica Park and played college baseball at Michigan. In New York, J.A. Happ allowed one soft single in seven shutout innings to win his third consecutive start since being traded from Toronto to the Yankees. Happ (13-6) struck out four and walked four, throwing 71 of 106 pitches for strikes. The only Tampa Bay hit he permitted was a flyball by C.J. Cron that fell in front of left fielder Brett Gardner in the fourth. In Kansas City, Kevin Pillar hit a two-run homer with two outs in the eighth inning to lift Toronto over the Royals. In Baltimore, Chris Davis, Adam Jones and Tim Beckham each homered to back a strong performance by starter Andrew Cashner, and the Orioles snapped a five-game skid.